The Ethernet communication channel allows your device to be connected to a local area network for various devices, providing 10 Mbps/100Mbps transfer rate. Shielded 6E category twisted-pair 10/100Base-T cables with RJ-45 connectors are only supported. The maximum cable length between the Ethernet port of the device and the 10/100Base-T port on an Ethernet router/switch (without repeaters or fiber) should be 100 m (323 ft). However, in industrial application the cable length should be kept to a minimum. The Ethernet cabling with straight-through method is recommended as below. PLEASE MAKE SURE YOU DO NOT MAKE AN INCORRECT CONNECTION! The most common wiring for RJ-45 cables is the “straight-through” cable, which means that the pin 1 of the plug on one end is connected to the pin 1 of the plug on the other end. 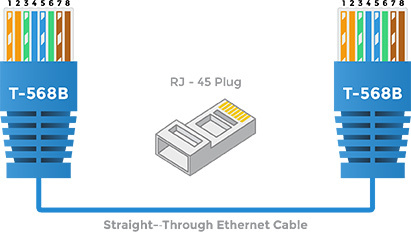 The straight through RJ-45 cable is commonly used for connecting network cards with hubs on 10Base-T and 100Base-Tx networks. On network cards, the pair 1-2 serves as a transmitter, and the pair 3-6 as a receiver. The other two pairs are not used. On hubs the pair 1-2 is the receiver and 3-6 the transmitter. It may be best to wire your cables with the same color sequence. In this cable layout, all pins are wired one-to-one to the other side. The pins on the RJ-45 connector are assigned in pairs and every pair carries one differential signal. Each line pair has to be twisted. In a small network with only two computers the use of the “crossover” RJ-45 cable is necessary, where the transmitting and receiving lines on both RJ-45 connectors are cross connected. 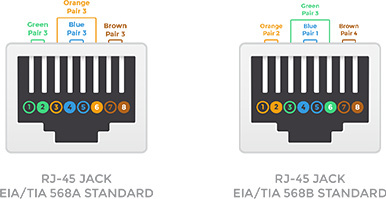 The color-coding for the crossover RJ-45 cable has been defined in the EIA/TIA 568A standard. In the crossover cable layout you should remember that one end is normal and the other end has the crossover configuration.